There’s a speed-dating scene that I absolutely had the most fun writing. It makes me laugh to this day. As for the hardest scene: it was actually the final scene/chapter. I originally had a totally different ending for the book and I wrote my first draft that way. And then one of my very trusted beta readers pointed out to me that it was the wrong ending. So I wrote a different ending, and I spent a lot of time debating which one to go with. It was the first time I’d ever struggled so much with an ending (usually, I’m pretty good at beginnings and endings and get stuck somewhere in the middle). But, finally, I realized she was absolutely right and ending #2 won out. There are a lot of amazing-sounding fandom books coming out this year, which I haven’t had a chance to read yet (All the Feels, Scarlett Epstein Hates It Here, Gena/Finn). Of ones I have read, I would say Ready Player One was such an intricately plotted, brilliant action/adventure book with so many pop culture references. And as far as fantastic contemporary YA romances go, I have to go with The Art of Lainey by Paula Stokes. That book is vastly underrated, in my opinion. You go in for a fluffy romance, and get sucker-punched by these complex, multi-dimensional characters that—I promise—won’t leave your head and heart ever. How long did you work on THE GEEK'S GUIDE TO UNREQUITED LOVE? I wrote the first draft over the course of about six months. I was pregnant (and very ill) for most of it, so I only had about 20 minutes in the mornings to work on it before the nausea made it impossible to focus. It was an interesting experience, and hard, but I was extremely proud of what I accomplished by the end. Even though I’ve always had a full-time job and written in my spare time, this taught me even more about stealing whatever moments you can to write—a lesson that’s proving extra valuable now that I have a baby. What do you hope readers will take away from THE GEEK'S GUIDE TO UNREQUITED LOVE? I hope it makes them laugh and I hope that the love story—whether it’s love of another person or love of a piece of art—resonates with them in some way. Sarvenaz Tash was born in Tehran, Iran and grew up on Long Island, NY. She received her BFA in Film and Television from New York University's Tisch School of the Arts. This means she got to spend most of college running around and making movies (it was a lot of fun). She has dabbled in all sorts of writing including screenwriting, copywriting, and professional tweeting. She currently lives in Brooklyn, NY. 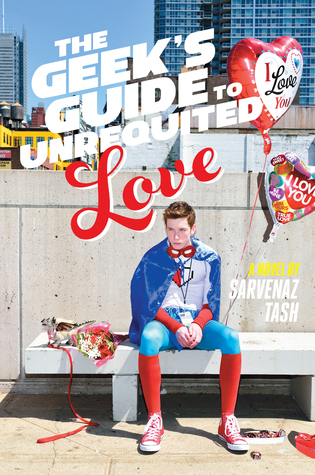 Have you had a chance to read THE GEEK'S GUIDE TO UNREQUITED LOVE yet? Have you ever been torn between two endings for your novel? Do you steal whatever moments you can to write? Share your thoughts about the interview in the comments!